Somebody please make a good Thing movie! I found this review of The Avengers on Youtube by The Amazing Atheist. If you’re not familiar with TAA, he is a world-class ranter. He is a proud misanthrope and there are not a lot of things he likes. I find him wildly entertaining at times. That’s not to say I always agree with his point of view. I just appreciate humor and passion, and TAA has both in spades. I love movies based on comic books because they were a way of life for me when I was a kid. I used to beg my mom to buy me a new one every Sunday after church. When we started moving around a lot and I felt like a square peg being jammed into a round hole, I would sit in my room for hours and read comic book after comic book. 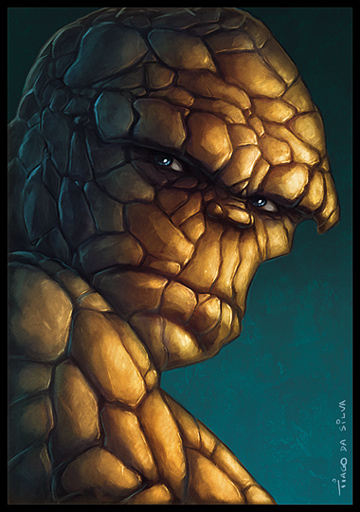 My favorite was Ben Grimm as Thing. Superman was a close second, but Thing was awesome to me because he too was a square peg. Plus, Thing and the Hulk had some epic battles. The major failing of the Fantastic Four movies is that they made Thing just as tall as everyone else. He’s as big as the Hulk! Something I’ve never told anyone before is that I’ve always thought that The Oz Chronicles is really a superhero origins story. Oz is thrown into a dark world where he has to acquire warrior skills and special powers to survive. It has Stan Lee’s influence all over it. I’d actually love to do a graphic novel version of The Takers. Here’s TAA’s review of the Avengers. Be forewarned, it is riddled with profanity. It’s just too funny not to share. This entry was posted in News I Find Interesting and tagged joss whedon is awesome, movie reviews, review of the avengers, The Avengers. Bookmark the permalink. ← Banshee Worm King: Book Five of the Oz Chronicles is now available for Kindle.